MySmark recently started a short experimental research about the perception of #DestinationPersonality from the web. Therefore, two destinations in Ireland were selected and the official online websites of these destinations were used in order to get a first impression of the destination. Most of the Interviewees have never visited the specific destination, which contributed to the concept. During the survey, the participants were able to scroll through one of the websites for one minute. After that the survey began automatically. 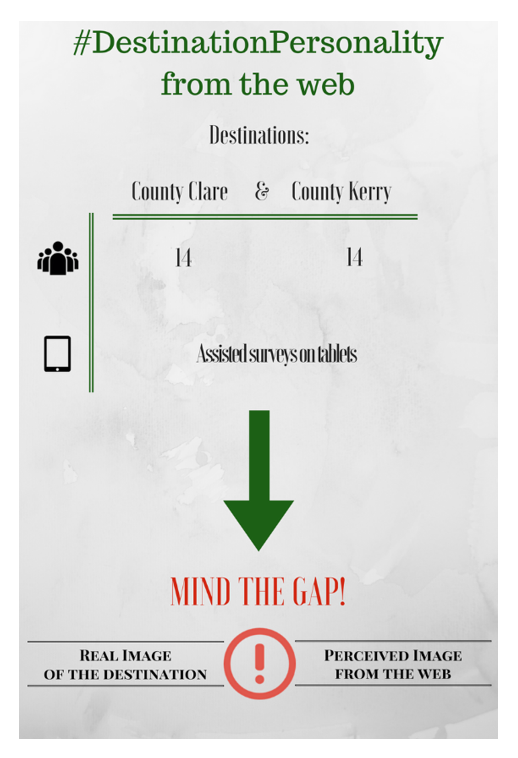 The destinations chosen for this research were County Clare and County Kerry. The outcome of the research gives some interesting insight. The results show, that the website of a destination is still the most used channel when it comes to searching for further information about travel destinations. In comparison, the websites of County Clare and of County Kerry are extremely different. While clare.ie sets the main focus on pictures and impressive images, gokerry.ie uses much more written content and a more static design. The project results show that the design of the website has a major influence on the perception of a destination. Even if the destination might be in general perceived as beautiful and interesting, a bad website design can have negative impact on this image. So to say, a gap between the real perception of the destination and the perception through the online channel (website) can emerge. Therefore it is essential to make sure that the design of a website expresses exactly the spirit or personality of the destination and the real image of it. It needs to be considered that the outline of this website is engaging and appealing to those who have an interest in this specific destination. This first experimental research survey is just the beginning of #DestinationPersonality from the web and will be further advanced in the future in order to give verified insights and connections.